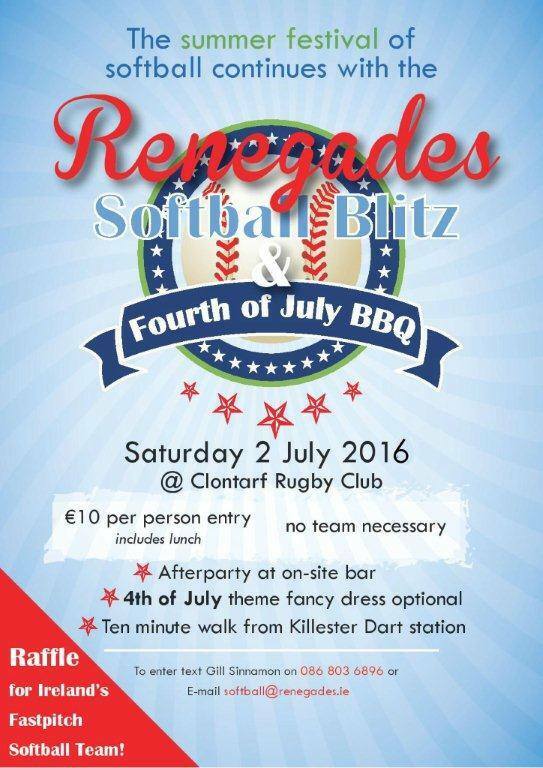 This year the Renegades Fourth of July Blitz will in part help sponsor the Woman’s National Fast Pitch team just before they head out to play in Surrey, BC, Canada for the WBSC XV Women’s World Softball Championship. There will be fundraising in the form of contests and a raffle at the end with some truly fantastic prizes. This is the last chance we’ll have to wish these ladies our best before they head out to what will prove to be an exciting experience for all involved. This is the fifth year that the Renegades have put on their popular one day blitz.the Renegades blitz runs a bit differently than other blitzes as it is player driven and not team. Anyone is welcome to show up on the day and celebrate with some softball a picnic lunch and if you are interested a BBQ that follows. Entry into the blitz is only 10 euro and includes lunch, while the BBQ afterwards is only an extra 5-er.